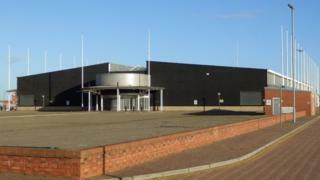 Up to 600 new jobs are being promised with the redevelopment of a former shopping centre in Hartlepool which has been derelict for 13 years. Jacksons Landing has been disused since 2004 and was purchased by Hartlepool Borough Council in 2013. The waterfront site is set to become a sports and leisure hub and the nearby maritime museum will be extended. The scheme is part of an already agreed project to regenerate the town over the next eight years at a cost of £500m. The authority's chair of regeneration, Kevin Cranney, said preparatory work on the five-acre (two hectare) Jacksons Landing site would begin next year. Hartlepool is already partnered with the National Museum of the Royal Navy (NMRN), which has pledged to loan a vessel to the town as part of the revamp. Mr Cranney said: "This is definitely going to happen. "We met with executives from the museum last week and they are already talking about bringing up a ship next year to be housed on the site. "We are hoping it will all be completed by 2025 and the groundworks will begin next year. "We expect the watersports phase of the development to be ready by 2019."